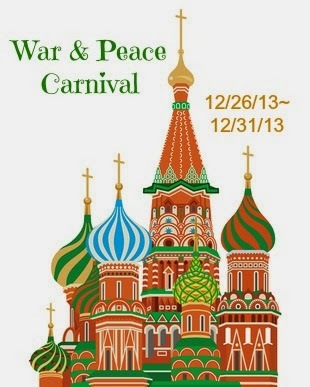 The War and Peace Carnival! We made it through a year of reading War & Peace and now we're celebrating! All this week, from December 26-31, we hope you'll post about something relating to War & Peace and the country it takes place in. This can be anything! You could make a Russian recipe, watch one of the movie versions of War & Peace and review it, review another Tolstoy book, review a Russian restaurant, read and review a nonfiction book that takes place during the time period, write a poem celebrating the fact that you finished (or couldn't!) --anything you want! You can also also include your final War & Peace thoughts on this Linky! (feel free to put your blog name and in parentheses what your post is about) Thanks to all who participated this year, it was a big goal--we made it through--and now I'm looking forward to NOT having a book over a year to read!